The Fund for Assistance to ROCOR has been helping the Lavra and the refugees living here for several years now. 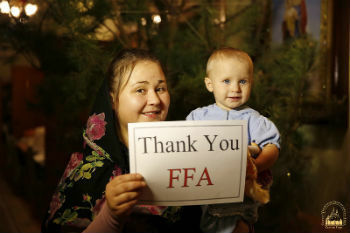 FFA donors have sent aid, love, and good wishes to the suffering people through the Fund in 2014 and 2015. The monies received at the end of 2016 were gratefully accepted by the monastery brethren, who are struggling under the weight of responsibility for the hundreds of refugees they have been taking caring of for several years. The last batch of generous donations received from FFA donors was used to purchase necessary medicine for the refugees, and also provided much needed relief in the paying of the season’s heating bills. Heating prices have recently risen three times, and the monastery was struggling to pay the constantly growing bills. The Lavra was not designed or prepared for taking care of so many people for many years, so any kind of aid for the refugees is accepted with sincere gratitude. On behalf of the whole of Svyatogorsk Lavra, her deputy abbot Metropolitan Arseni of Svyatogorsk, brethren, and all the refugees, who have found shelter within the walls of the monastery, expressed their sincerest gratitude to the Fund for Assistance to ROCOR for the aid sent in 2014-2016, as well as to the Russian-American Cultural Society of Cleveland, who provided a large part of the sum. “We thank the All-Merciful Lord for consoling us at this difficult for the monastery time with your brotherly love and support! It is truly the mercy of God to see active compassion of our brethren in Christ in response to the present calamity suffered by our Fatherland and our flock. 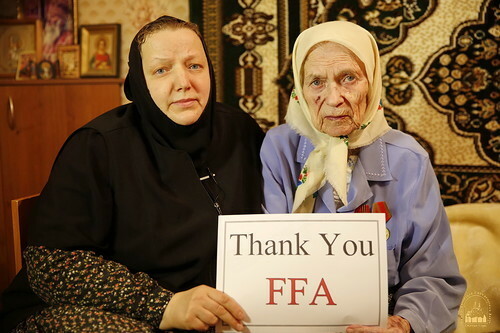 At this time of trouble the help of the Fund for Assistance to ROCOR is especially valuable to us, and we are sincerely thankful for the prayers and financial aid to the Svyatogorsk Lavra! We sincerely value and always remember that your hearts ache for our monastery, for the suffering people who found refuge here, and we thank you for your responsiveness to the tribulation that has come over the Ukrainian lands. Our brethren and refugees sincerely thank all whose kind hearts responded to our troubles, and who has come to help us at this difficult time. As King Solomon said: “The generous will themselves be blessed” (Prov. 22:9). May the Lord be merciful unto all who perform mercy. We wish you and all your staff love, peace, and prosperity. We pray to the Holy Theotokos that for all the mercies performed for Her holy monastery, She may be a quick Intercessor and Helper to you and all Christians of the Russian Orthodox Church Outside of Russia, and protect us from all evil under Her holy veil! (An excerpt from the official letter of thanks to the Fund for Assistance to ROCOR).